AIBDPA WISHES A VERY HAPPY EASTER TO ALL. MODI GOVERNMENT PROMISED TWO CRORE JOB EVERY YEAR- BUT A STUDY SAYS 5 MILLION JOBS LOST BETWEEN 2016-18. 5 million jobs lost between 2016 and 2018 – says a study of the Azim Premji University. It is shocking to know that 5 million Indians have lost their jobs between 2016 and 2018. This is mentioned in the State of Working India (SWI) 2019 Report, released yesterday by the Bengaluru based Azim Premji University. It may be recollected that the Demonetisation was implemented in November,2016. This report of Azim Premji University confirms the accusations of economists that lakhs of jobs were lost due to Demonetisation. Unemployment is one of the biggest problems being faced by the nation. Prime Minister, Narendra Modi came to power, by assuring to create 2 crore jobs per year. He miserably failed in fulfilling this promise. NATIONAL COUNCIL MEETING- REPORT OF SECREATRY, STAFF SIDE. KRISHNA DISTRICT HELD GENERAL BODY MEETING. 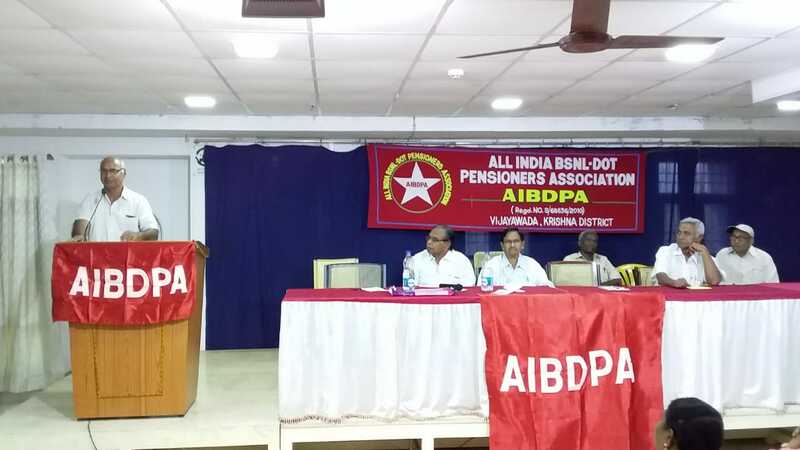 General body meeting of AIBDPA, Krishna District was held on 13.04.2019 at MB Vignana Kendram, Vijayawada.The meeting was presided over by Com.N.Syam Prasad and Com.G.Gopal Rao.District Secretary Com. R.Madhava Rao gave the activities report and Com. B.Mohan Rao submitted financial report. Activists from different places spoke on the organisation and membership and problems.Com.K.S.C.Bose, Circle Secretary in his address explained to the members regarding the organisational position in districts,Circle and on the All India conference held at Calcutta and its decisions.The meeting congratulated Com. P.Asokababu for his reelection as Vice-President CHQ. Com.P.Asokababu, Vice-President CHQ, in his elaborated address explained to the members the present position of Pension revision, medical facilities, wage revision, financial position of BSNL, VRS proposal, non-implementation of MOC assurance, programmes of AUAB and the need to strengthen the organisation and united struggles. LET US UTILIZE THE OPPORTUNITY WISELY. The pension revision of BSNL retirees from 01-01-2017 stands frozen now. But why? The Hon’ble Minister of Communications and the Secretary, Department of Telecommunications had given categorical assurance for pension revision delinking wage revision in the discussion had with AUAB on 2nd and 3rd December, 2018. But the DoT has not initiated any action on it and are still pursuing for pension revision after wage revision. How can the buerocracy dare to take such a stand without the support of the government.? Yes, it is a treacherous game plan being enacted by both the government and the dominant section of buerocracy in DoT. Is it an isolated issue.? Certainly not. In the same meeting with AUAB, the Minister had given some other assurances also,viz, wage revision, 4G spectrum to BSNL, Pension contribution on actual pay instead of maximum of the pay scale. None of these have been implemented so far and the entire BSNL employees had to go for a three days strike from 18th February, 2019 against the cheating.. Meanwhile BSNL was pushed back to an acute situation that the salary to the employees for February , 2019 had to be deferred. It is no secret that Reliance Jio is allowed by the government to operate freely with predatory pricing violating the rules and license provisions.ever since its launching in September, 2016. This has virtually put the entire telecom sector to great crisis and all the service providers are incurring huge losses. The aim of Mukesh Ambani, the richest corporate in India and owner of Reliance Jio is to dominate the telecom service sector by grabbing the customers of other companies and to increase the market share and revenue share to 50%.. However, BSNL is the only operator resisting the Reliance Jio to a great extent with comparitively less liability. This has embarassed Mukesh Ambani and is pressurising the Modi government to eliminate BSNL from the telecom sector and naturally the government has to oblige as it is the government for the corporates . This is the real backgound for the present created crisis in BSNL.This is nothing but part of the anti-PSU policy of Modi government, another glaring example seen recently is ignoring the reputed Hindustan Aeronautics Ltd in the corrupt Rafale deal for the sake of Anil Ambani’s company. The cheating of workers and pensioners is nothing new and the on the contrary has become the hallmark of Modi government. 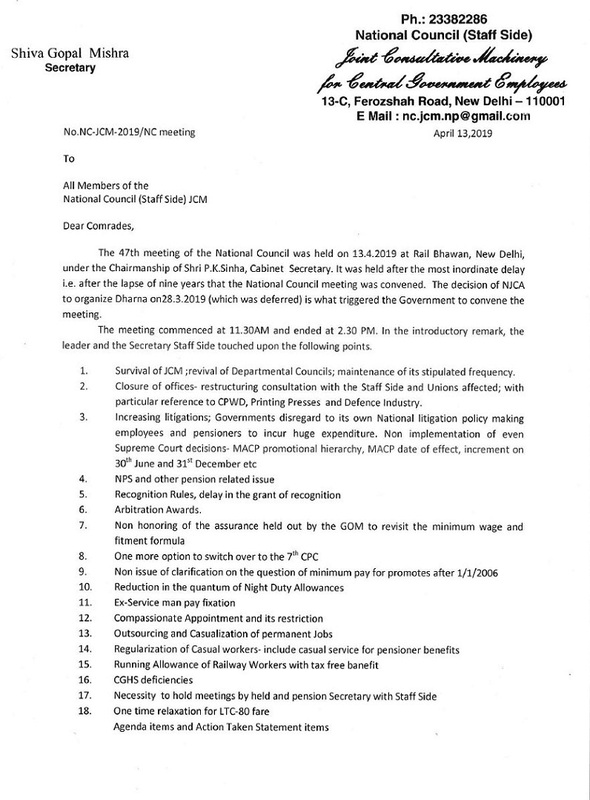 The retrograde recommendations of the 7th Pay Commission was implemented unilaterally by Modi government against which an indefinite strike from 11th July, 2016 was declared by the Joint Action Council of Central government organisations. The Modi government was thus compelled for a negotiation with the JAC on 30-06-2016 and the Group of Ministers headed by Home Minister Rajnath Singh gave assurances on increased minimum pay and fitment, Option 1 (Parity in pension), the only positive recommendation for the pensioners and increase in medical allowance. But the government did not honour its commitment and central government employees and pensioners were cheated. Despite sustained struggles, Modi government has not done anything on the New Contributory Pension Scheme which is proved now to be a No Pension Scheme. Modi government during its five year term never wanted to concede any of the demands of the workers, put forward by the Central Trade Unions against which many struggles including nation wide strikes were conducted. Labour laws were amended to suit the interests of the employers and the fixed term job amendment is nothing short of enslaving the workers. The farmers and agricultural workers were also compelled to wage several struggles against non-implementation of assurances and the worsening situation in the farm sector. Now the people are convinced enough as to how the adverse impacts of the neo-liberal policies being implemented vigorously by the Modi government have affected their life. It is pertinent to mention here about the hollow promises given by the BJP during the last Lok Sabha elections in 2014; Rs.15 lakh to the bank account of every Indian, 2 crore jobs every year, Petrol @ Rs.40 per litre etc. In addition to these enormous damage is done to the secular fabric and communal harmony of the country during the last five years. Constitutional institutions are filled with ‘yes men’. ; even judiciary is not spared. Now, we have to think very seriously what will be our future if the same BJP is voted to power? No doubt,it will be a complete disaster. The need of the hour is a secular and democratic government in the country which will have an alternate policy focusing on the welfare of the poor and common people.. So let us be careful while utilizing the franchise in the ensuing general elections. Salem District Branch held its 4th biennial conference on 07-04-2019 at Telephone Exchange, Namackal. Com.P.Ramasamy, District President controlled the proceedings. Namackal Branch Secretary, Com.V.Gopal welcomed one and all. Inaugurating the conference, Com.C K Narasimhan, Circle Secretary spoke elaborately on the issues, Kolkata AIC decisions, Sanchar Bhawan March and AUAB agitations, the ensuing 5th Circle Conference at Coimbatore. 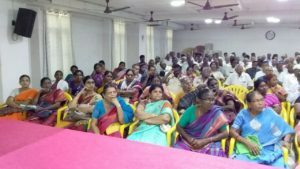 Com.N Kuppusamy, Asst Circle Secretary made a special address and narrated the importance of the general election and appealed to utilize the ballot effectively so that a secular and democratic government is voted to power. A host of leaders including Com. S Tamilmani, Circle Vice President , BSNLEU addressed. 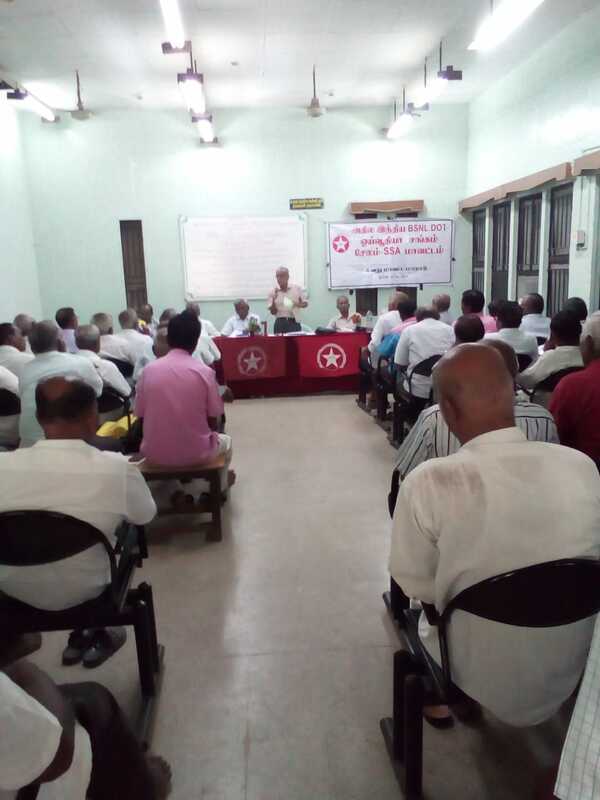 As has been decided by the National Executive Committee at its meeting held at Chennai on 5.08.2019 the dharna fast programme was carried out on 15thMarch, 2019 at Jantar Mantar. We had to encounter quite a number of problems as has been the case on the earlier occasions to get the permission of the Police authorities of Delhi to conduct the programme. This time, the excuse for refusing permission was the notification (Press release) of the Election Commission declaring election for the 17th Lok Sabha. The Police authorities wanted us to get the permission of the Election observer at Delhi for which our comrades at Delhi has to endeavour for a whole day. At the end of the day, the Election Observer rightly observed that she was appointed as an observer for holding the election and not for holding Dharna. In the evening, a meeting of the available comrades was held and it was decided that what may, we will hold the Dharna Fast at Jantar Mantar. The Police ultimately did not object and the programme went on without any further hindrance. The programme commenced at about 11.30 AM. Com. V.A.N. Namboodiri, Patron NCCPA was the first speaker and detailed the purport of the programme. Com. Shiv Gopal Misra , President, NCCPA inaugurated the programme and the same was conducted by the Secretary General, Com. KKN. Kutty. We had invited all the Federations and Associations of the working employees and most of them could come and greet the programme. Com. Deep Chand on behalf of the Delhi Unit welcomed the participants. Other speakers included Com. Pavitra Chakraborty, Com. K. Raghavendran, Com.K G Jayaraj, Com. I.S. Dabas, Com. H.S. Sidhu, Com. Rehman, Com. T.S. Parameswaran. Com.R N Parasar, Com. Giriraj Singh, (Both from NFPE) Com. Brighu Bhattacharya,(Civil Accounts) Com. Ashok Kanojia, (Confederation)Com. Ajoy Tewari, (ITEF) were the speakers who greeted the dharna fast programme. 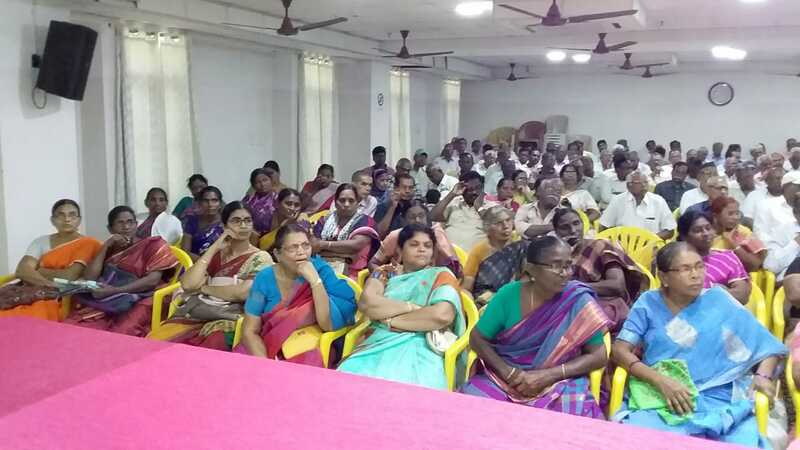 Almost all the speakers exhorted the participants to take note of the nugatory attitude of the Government towards Central Government pensioners for the past 5 years and utilize the strength and power to vote them out of power . The programme was concluded at 2.30 PM. The National Executive had targeted to ensure the participation of about 2000 comrades in the programme. Though we could not achieve it ( the participation was estimated to be about 1500), it had been a fantastic programme. We publish hereunder a photograph we have taken almost about 1.00PM, when the programme was going on, which no doubt will bring out the success of it in clear terms. The National Secretariat which met on 16th had unanimously opined that despite the hurdles created ,( the IB and its sleuths spreading the canard of cancellation of the programme on the pretext of the declaration of the election) was nassive and magnificent. . Some of the comrades, unfortunately without even verifying the facts had cancelled the tickets believing the rumour spread. There had been some other cancellations too as the last minute problem of physical disabilities of the participating comrades and cancellation of flights especially the Jet flights. . It was heartening to note that every affiliate of the NCCPA had tried to adhere to the quota, some exceeding . As on the last occasion, this time also the best participation came from the All India BSNL DOT Pensioners Association, who had earlier organized a march to Sanchar Bhawan from Eastern Court to highlight their own specific demands and problems. The NCCPA Sectt. has requested its affiliates and State Units to undertake a proper review to identify the deficiencies so that it could be removed effectively before we could undertake further programmes. The NCCPA will be grateful if the affiliates and the State Units convey to us immediately on receipt of this communication of the extent of participation of their members (State-wise) to have a clear picture. Before I conclude, let me place on record that the programme had been a grand success in as much as we could demonstrate the discontent and grievances of the Central Government pensioners in an extremely magnificent manner and the credit for which goes to each and every participant and the leaders at the State and district levels who took the pains to elicit their participation, look after them properly and ensure that they return to their homes with fond memories . The message that the time has come to think seriously to bring in a government which will think in terms of the welfare of the Senior Citizens and the poor in the country has gone unambiguously and loudly amongst the pensioner community. The meeting was held at AIRF Library Hall, presided over by Com.V.A.N. Namboodiri, Patron of NCCPA. The Secretariat reviewed the conduct of and participation in the programme, the conclusion of which has been detailed in the preceding paragraph. In order to comprehend the strength and weakness , which is the very purpose of such reviews, the meeting has decided to call for details of participation from each of the affiliate and State Unit so that corrective steps could be taken to remove the weakness in the organisation. The meeting noted that the absence of the important office bearers of NCCPA, i.e. Secretary General, Deputy and Assistant Secretary Generals, who had to be away from 24th Feb. to 9th March, to attend the TUI meeting at Bogota must have acted as a debilitating factor, which was in any case unavoidable. Option No. 1. The suggestion of the Secretary General, emanating from the discussions, he had with the Advocates to the effect that petition must be filed before the Pr. Bench of the Tribunal was accepted by the house. The proposal of CGPA Kerala to engage Shri Kaleeswaramraj & Associates was also accepted. The package deal for the case is reported to be Rs. 2 lakhs, of which one lakh has to be paid at the time of filing the case. The Secretary General will meet the Advocates in the first week of April and will finalise the matter so that the petition could be filed when the court re-opens after the summer vacation. It was decided that each affiliate and the State Committee will contribute to the litigation fund. The amount to be contributed will be worked out by the Secretary General after ascertaining the membership base of each of them. MACP Case. It was decided to file the case after obtaining application from those who are affected or benefitted. Each applicant will be asked to pay Rs. 1000 initially and the advocate identified at the instance of AIPRPA will be engaged. All affiliates and State units will collect the applications and forward the same to the CHQ without further loss of time. NCCPA Journal. The journal, it was noted, is running in losses. To obviate the difficulties the only way was to increase its price, which can only be done at the next conference. In the meantime, the Assistant Treasurer and the comrade in charge of printing the magazine at Kolkata will prepare an Income and Expenditure Statement from 2015 to date and send the same to the CHQ. They will also indicate the amount of dues outstanding so that steps could be taken to recover it. Finance: It was brought to the notice of the house that the travelling expenses to go over to Bogota had to be met by the Secretary General from his personal funds and the same has to be reimbursed. While the outstanding dues as per the present provisions of the constitution will be worked out by the treasurer it was decided by the house to seek donation to carry out the day to day activities of the CHQ. The Secretary General indicated that he was not in possession of the list of all the affiliates till date and Com. Pavitra Chakraborty has promised to provide him a copy thereof immediately. In the meantime, all affiliates are requested to provide the details of membership for the year F.Y. 2015-16, 2016-17, 2017-18 and 2018-19 separately. This will enable the Sectt. To work out the details of outstanding. Next Conference: At the last National Executive Committee meeting, Comrades from Rajasthan CGPA had been requested to undertake the exercise of feasibility of conducting the conference. It was informed to the house that so far no concrete suggestion has come from them. The house discussed the matter further as the Conference was overdue. The meeting decided that in any case conference must be held before the end of 2019. A final reply from Rajasthan may be solicited before the end of the month. AIPRPA, Tamilnadu State Unit will in the meantime explore the possibility of holding the conference at Chennai and intimate the outcome of their discussions to the Secretary General. Affiliation application. The application from the Punjab National Bank Pensioners association was considered. The representatives of the said organization were present at the meeting. The members had the opportunity to hear them explain their case. The Bank Comrades will be provided with the copy of the constitution of NCCPA. The meeting authorized the Secretary General to grant affiliation to them. Any other matter. Com. Somayya presented a paper containing the grievances of the CGHS beneficiaries to the meeting. It was told that JCM is making efforts to have a meeting with the health secretary to discuss the issues. Com. Secretary General informed the house that the NCCPA has been granted the PAN No. though the communication is yet to be received in writing. He hoped that the same will be delivered at the Treasurer’s residence soon. The Second world congress of the TUI (Pensioners and Retirees) was held at Bogota in Columbia. The NCCPA was represented by its Secretary General, Com. K.K.N. Kutty and oln behalf of AIPRPA, Com. K. Raghavendran and on behalf of AIBDPA, Com. K.G. Jayaraj attended the congress. A detailed report over the congress has been placed on the website and the same is carried by our journal for this month. It is to be noted that there had been no other representatives from India. All the Indian delegates have been elected to the administering Committees of the TUI. Com. K.G. Jayaraj has been elected to be one of the Executive Committee member, Com. K.Ragavendran in the Technical and Research Commission and Com. K.K.N. Kutty in the Finance Control commission. The TUI (P &R) is a vibrant international body and had been functioning in the last five years very well and have extended its influence to all continents. The responsibility of the expanding its base in Asia particularly is now cast upon NCCPA, even though the Nepalese delegation has been elected to be one of the office bearers. Com. K.G. Jayaraj particularly will have this carved out for him and our success will make NCCPA a world respected body. NCCPA Secretariat Resolution on Elections. The National Secretariat of NCCPA, which met at New Delhi on 16th March, 2019 while reviewing its efforts in the last five years getting the Government to address the issues, concerns, grievances and demands of Central Govt. Pensioners came to the conclusion that the nugatory attitude of the Government in power at the Centre was the root cause of not finding resolution to any of the issues. It was so disappointing for the entire Pensioner community that the Government chose to crush their expectation for a decent pension raised by the recommendation of the 7th Central Pay Commission by rejecting the Option No. 1 on the specious ground that it was not feasible to be implemented due to the non availability of records in the case of a minor segment of them. The recommendation, if accepted, would have brought about the much sought after parity between the past and present pensioners. The meeting noted with dismay and anger that during the five year period, the NDA under the BJP was in power they had acted contrary to the directive principles enshrined in the constitution of the country i.e. to provide justice to the people, social , economic and political. It had continued with the hated neo-liberal economic policies, the change of which was the ardent hope of the people when they voted them to power in 2014. The UPA-2 regime’s adherence to these policies, discarding the welfare scheme evolved by the successive post independent governments of the country, which had been the greatest source of sustenance of the poor people; permitting the unhindered foray of private enterprises in every sphere of economic and industrial activities; the rampant corruption were the significant concerns of the Indian multitude in 2014. They expected a change, a change that will bring about deliverance from abject poverty and hunger. They were disappointed and are despondent. The Central Government employees and pensioners know well how this government took decisions on the recommendations of the 7th CPC. There had been no negotiation at all- a complete departure from what had been the practice hitherto. Assurances held out to force withdrawal of the indefinite strike slated to commence in July, 2016 was never honoured. Not even once the group of Ministers met the union representatives, thereafter. The JCM which was set up as a forum for effecting negotiation with the employees never met even once during the Modi regime. Even small issues, which has a bearing only over a very small segment of the employees were not addressed. Only those benefits the higher echelons in the bureaucracy received consideration and favourable nod. The employees were dragged to litigation and there had been an eruption of petitions before the Courts. Contrary to its own directive not to prefer appeal over the verdicts of the Administrative Tribunals, this Government had been preferring even writ petitions against the Tribunal’s orders as a matter of routine, derailing the process of an expeditious justice delivery system. This attitude resulted in the litigants ( who are often pensioners or low paid employees) to shell out enormous amounts to plead their cases before Courts to seek justice. Even after such procrastinated and inhuman journey, the Government either will not act upon these judgements or restrict the application of those judgements only to those who were the petitioners in the court. This has been the gruelling story of pensioners and employees in the last five years. Never in the history of wage negotiations the Government especially in the matter of pension had taken recourse to rejection of a recommendation made by the Pay Commission. Before the Courts, the Government avers that the recommendations of the Pay commissions are to be treated as one that has emanated from an expert body after deliberations of all pros and cons. The opinion No. 1 was conceived by the Commission to bring in parity between the past and present pensioners in real terms. It was rejected on the malicious ground that it was not feasible to implement in the absence of relevant records. It was admitted unashamedly that the records were available in 86%of the cases and in the rest of the cases supplementary evidences could be collected to operationalise Option No 1. It is not difficult to discern the real reason behind such rejection as the said recommendation was not providing the requisite benefit for the personnel in organised Group A services, as they are favoured with a time-bound promotion scheme throughout their service career. 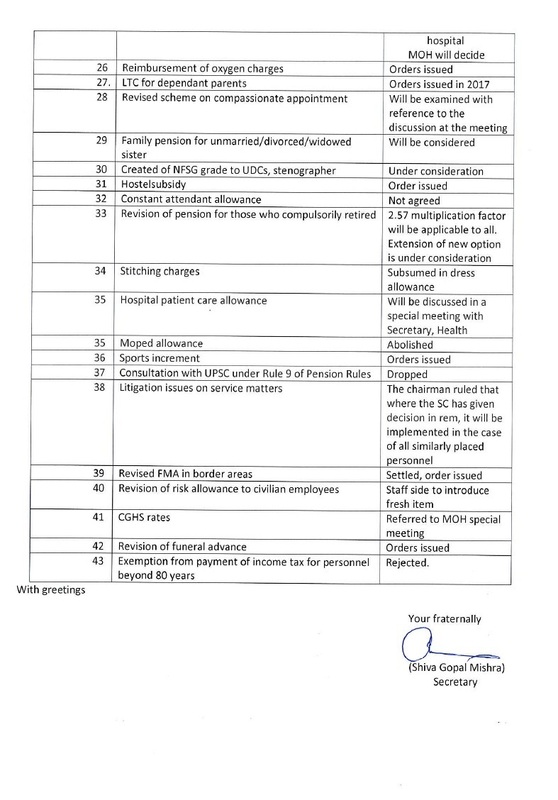 The alternate suggestion made by the Committee headed by the Secretary Pension was to benefit the very same personnel in Group A services. It was strange that even the most sensible suggestion put forth by the Staff Side to offer all the three options to the Pensioners were summarily rejected. Throughout the five year reign, this Government had been pursuing crony capitalism. The decision taken just before the announcement of the elections to hand over the six Indian Airports to private influential Group of companies is a befitting example. The country had been going through a continuous period of crisis, be it in agriculture, farm prices, industry, trade or employment. Farm income has crashed to its lowest levels against the poll promise of doubling it; rural wage growth was abysmally poor at 0.5%, unemployment has risen to the highest peak in the last 45 years as per CME, whose report has been concealed; the money collected over the sale of PSU shares had been doubled in the five years; all constitutional institutions were subjected to attack eroding its autonomy; resurgence of corruption in defence deals involving crores; indulgence in jingoistic nationalism to garner votes; to put faith beyond the pale of constitutional law and above all systematic disruption of the social harmony had been some of the hall-marks of the present Government in its five year long governance. The meeting thus came to the inescapable conclusion that a relook into the issues concerning the working people and pensioners would become possible only and only if a change is brought about by replacing the present people in the governance of the country . The inevitable democratic process for which the country is committed to, provides an opportunity to its citizens to make a change every five years. The coming two months will witness a fierce battle between those who want to retain the power and those who want to stop them at all costs. The meeting decided to appeal all its members to strive hard through diligent exercise of their franchise enlisting the support of all sections of the working class to bring about a change of Government in the country in the coming elections. Large scale of privatisation of public assets and handing over prime assets to chosen foreign and Indian corporates. Facilitating and promoting the loot of public money as reflected in the Rs.11 lakh crore plus amount of NPA. Destruction of livelihood of corers of people surviving on cash transactions through demonetisation. Virtual destruction of the micro small and medium enterprises the largest employment provider after agriculture through the implementation of the GST. The Mudra loan NPAs rose to 53per cent in the first nine months of 2018-19 from 2017-18. Farm income crashed to the lowest in 14 years during the last quarter of October-December, 2018 at 2.67 per cent (Central Statistics Office) RBI reports that loans that are not returned in the farm sector increased to Rs; 1lakh crore in September, 2018 from Rs. 70000 crores in September,2017.This is the level of agrarian distress leading to rising distress suicides of farmers. Our youth are frustrated due to the sharp fall in employment opportunities during the last few years. Modi had promised creation of 2 crore new jobs annually i;e. 10 crores by now. Reality is that the unemployment rate rose to the highest levels in 45 years at 6.1. per cent. (NSSo) Unemployment rate inFeb.2019 increased to 7.1. per cent from 5.9 per cent in 2018 (Centre for Monitoring Indian Economy) Situation in rural India is worse. NSSSO reports a 3.2.crore job loss of casual labourers from 2011-12 to 2017-18 affecting over1.5 crore families dependent on income from Casual labour and agriculture. As per the Gujarat Assembly records, the crime against SC and ST increased by 32% and 55% respectively during the last five years in that state. Women have been subjected to increased violence. The year 2016 reported a big increase in crimes against women- four rapes on an average per hour. Since then the Government has stopped publishing statistics by the National crime records bureau in this regard. During these five years the share of the total wealth accruing to the top one per cent of the population increased from 49 per cent in 2014 to 73 per cent in 2018. The lowest growth rate of GDP during these five years from.8.2 per cent in 2013-14 to 7percent in the first three quarters of 2018-19 even according to the motivated data series introduced by the Government. According to the earlier data series this stands at mere 4.7 percent. In the last quarter, the GDP growth rate fell further to6.6 per cent indicating that the economy is sliding into a recession. So much for Modi’s claims of India being the “fastest growing economy” in the world. GST collection despite all the tall claims shown steady decline from 7.6 per cent in 2017-18 to 5.8 per cent in 2018-19. This reflect a massive slowdown in the economy. Demonetisation and GST were a double whammy attack undermining the country’s economic fundamentals. Pre-demonetisation global GDP was 2.6 per cent and grew post demonetisation to 3.1.percent. In contrast, the post demonetisation India’s GDP growth fell from. 7.6 per cent to 6.8 per cent. Destruction of people’s livelihood has led to a drastic fall in levels of domestic demand crippling manufacturing and industrial growth. As a consequence, the country’s leading automobile manufacturer, Maruti Suzuki has announced a production cut of 27 per cent citing the fall in demand. The eight core infrastructure industries growth saw a decline of 2.9 per cent between February, 2014 and January, 2019. The index of industrial production registered an abysmal low of 0.3 percent inNovember,2018 compared to an average growth of 5.7 per cent in the preceding seven month. Depreciation of rupee to its lowest levels- the value of the rupee to a US dollar was 63.19in 2014. This shot to71.76 in 2019 . Drastic fall in India’s export earnings – Between Feb.2014 and January, 2019 India’s trade balance declined by whopping 29.8per cent. Growing current account deficit ie. Gap between India’s export and Import value has been registered during these five years. The current account deficit increased from 1 per cent of the GDP in 201718 to. 2.9 per centin 2018-19. In dollar terms this translates into deficit growth from 6.1. billion US dollars to 19.1. billion. Agriculture growth is at a record low during these years. 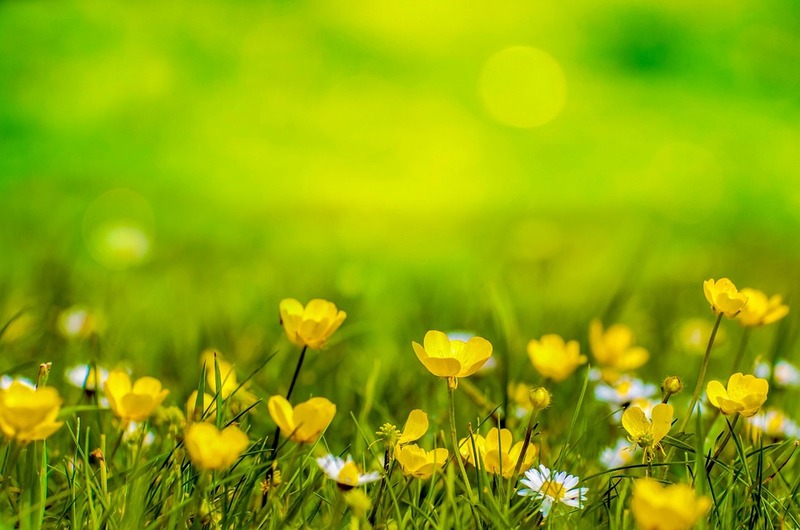 Agricultural growth rate fell from 5.1. percent to 2.7 per cent and further to 1.7per cent between Feb. 2015 and Feb,2019(CSO) The fourth successive negative growth rate registered in the last four quarters. The incidents of terror have exponentially gown between 2009-14 and 2014-19. The number of terrorist attacks increased from 109 to 626. The number of security personnel killed increased from 139 to 483. The number of civilians killed increased from 12 to 210 and the number of ceasefire violations increased from 563 to 5596. There is an alarming rise in the number of local youth joining militant groups. Local militants killed rose from 16 in2014 to 191 in 2018. Foreign policy orientation changed to dovetail to US global strategic interests reducing India as a junior partner of US imperialism. Deterioration of friendly relations with all neighbouring countries. Deepening defence ties with USA and Israel. Virtual abandonment of India’s leadership role in the non- aligned movement. 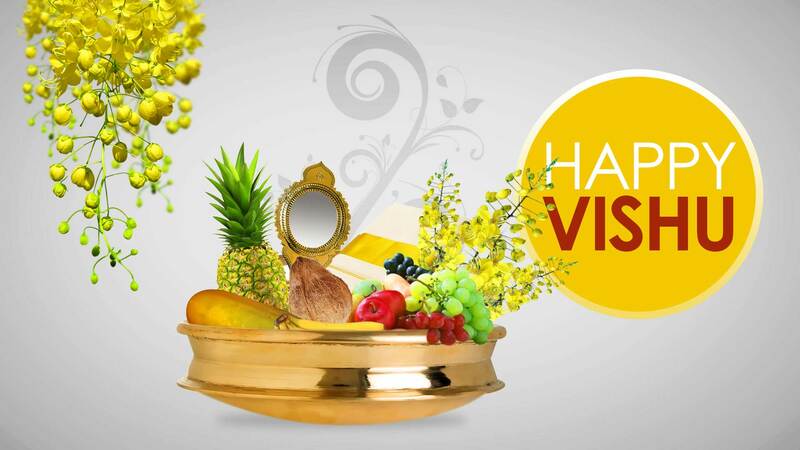 Abandoning India’s traditional solidarity with the people of different countries whose sovereignty is being attacked by US Imperialism including military interventions. The latest instance being Venezuela. During these five years, the BJP , particularly Narendra Modi has betrayed every single promise that was made to the Indian people. Generation of two crore jobs every year i.e. ten crores by now and MSP of 1.5. times the total cost of production to the farmers, return of black money and depositing 15 lakhs in the account of all Indians and so on. Engaging in a despicable politicising of the issue of terrorist attacks when the entire country and all opposition parties stood as one to fight terrorism. Sharp decline in the working conditions for the working class and employees is accompanied by unbearable hike in the price of petroleum products with the Government refusing to reduce its taxes and duties. Deepening agrarian distress leading to the ruination of the Indian farmers and growth in distress suicides.